For more tasty recipes, click here! Eating healthy is only one “slice of the pie” in caring for yourself. Read this post to find natural solutions for a clean, more chemical-free home and body! This past week I sat down at the kitchen table and typed out a basic meal plan for family dinners. A couple weeks ago I scribbled on a piece of scratch paper as many recipes as I could recall that are regular entrees for my family. I used that list to assign certain meals to certain days of the week. I am so excited about my new plan, and it is working quite well so far. Each day of the week has about three meal options, so I can choose one of the three meals for each day of the week and head to the store to buy what I need for the week. It takes a lot of thought out of weekly meal planning for the main meal, and that’s a good thing! We often eat sandwiches or leftovers for lunch, and thankfully there are many options available in the sandwich department… meat and cheese, pb&j, egg salad, banana and peanut butter, chicken salad, fried egg, pimento cheese, etc. 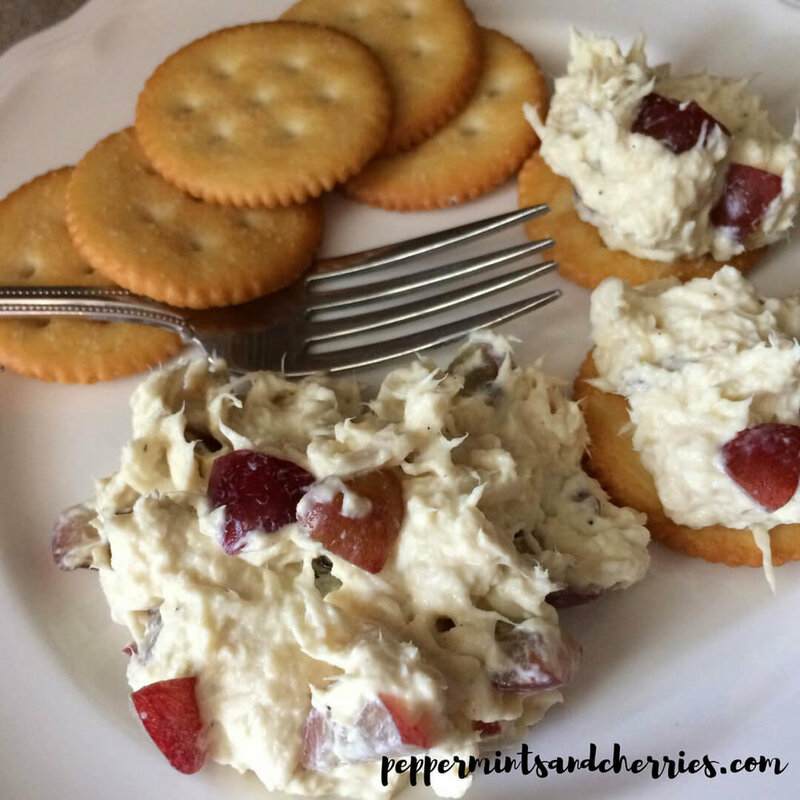 Chicken salad makes such a refreshing sandwich, especially on a hot summer day. However, it’s not always considered the healthiest of options with all that creamy mayonnaise. I use light mayonnaise, but the last time I made chicken salad, I used 0% fat, plain Greek yogurt in place of the mayonnaise, and it was surprisingly tasty! The yogurt is zero points on the Weight Watchers® Freestyle Program, so I was able to make chicken salad with zero points! The chicken I used is also zero points, and grapes are free. The other ingredients are yellow mustard and salt and pepper. I like eating chicken salad with bread or crackers, so those additions contribute points to the meal, but the chicken salad alone is zero points! If I make a chicken salad sandwich, I add a slice of extra sharp cheddar cheese and a couple slices of tomato. Great flavor! 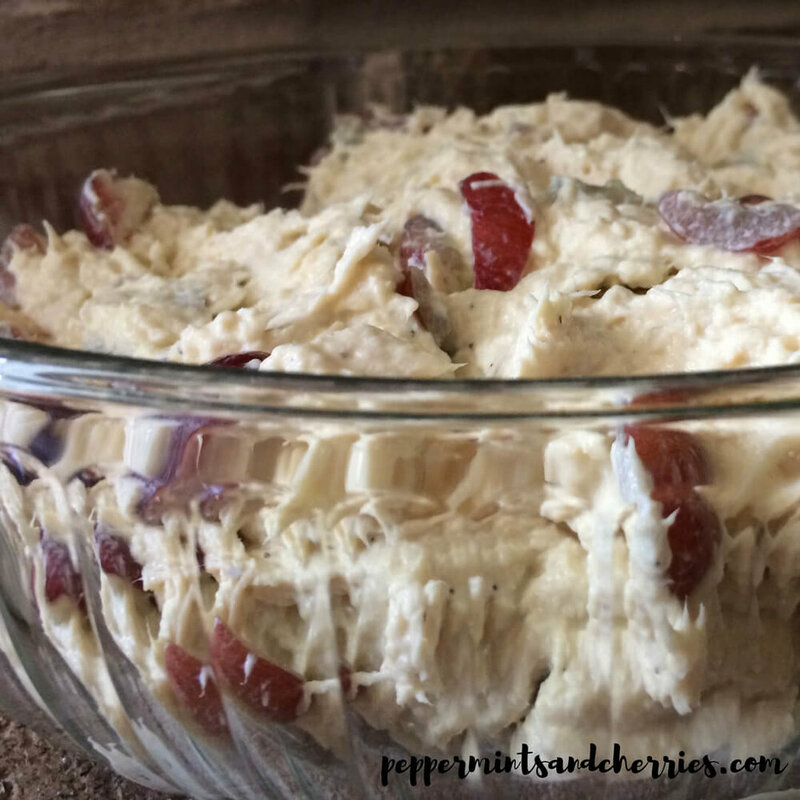 One secret key to making great chicken salad is keeping the chicken nice and moist. Using a slow cooker is one of the easiest ways to ensure the chicken doesn’t dry out. I also use boneless frozen chicken breast tenderloins as it’s just much easier to work with boneless meat! It’s super simple to place the frozen chicken in the slow cooker and let it cook all day. With my particular slow cooker, I cook the chicken on high for 6 ½ - 7 hours. Cooking times can vary depending on the device used and the type of chicken you purchase. I slice the grapes and use the red ones because they are sweeter and add nice color to the chicken salad. However, I have used green grapes too. Sometimes it just depends on what is available in the fridge! The measurements below are suggestions, but you can adjust them if you want the chicken salad more or less creamy, with more salt, less mustard, etc. Depending on your preferred tastes, you could also add celery and onion to the recipe for more flavorsome goodness! Almonds or pecans would also be an option, and you would just have to figure the points for the amount added. 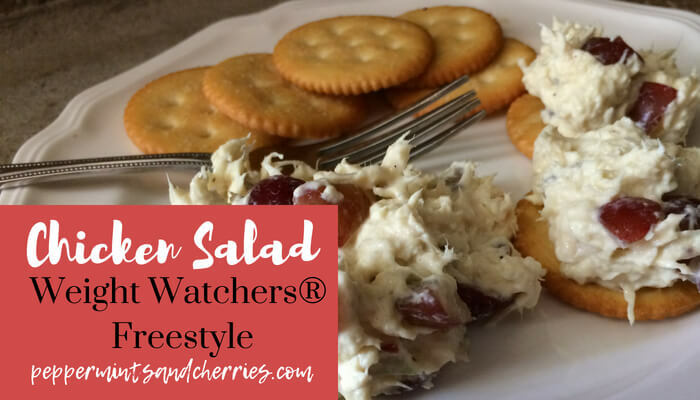 Even if you aren’t interested in Weight Watchers® points values, this chicken salad recipe is a healthy alternative to traditional chicken salad, and I hope you will try it! Today’s featured recipe is part of the Favorite Family Recipes Blog Hop. Please check out the links below to visit my blogging friends who are also sharing their Favorite Family Recipes! It’s Monday, so you can make a grocery run and add some of these new food options to your meal plan!